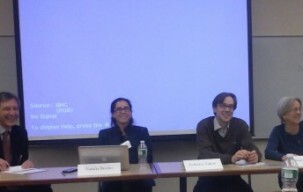 From Wednesday April 30 to Friday May 2, I attended the Conference on Grand and Petty Corruption in Developing States: Business, Citizens, and the State, organized at Yale by Susan Rose-Ackerman, Paul Lagunes, and Lynn Hancock. As can be seen from the website above, very interesting papers and discussions indeed, from a diverse crowd including lawyers, policy makers, political scientists, economists, bringing very diverse perspectives on corruption around the world from their positions in law firms, the OECD, governments or university among others. In this opportunity I presented an early version of what can be considered a discussion paper on the role of the construction of large scale hydroelectric dams in Paraguay (Itaipú and Yacyretá) in the 1970s in locking-in corrupt practices over the long-term, and in doing so adversely affecting the development trajectory of the country over the next 40 years. Here is a preview of the slides: The Story of Paraguayan Dams.